I’ve had the LAWRENCE OF ARABIA DVD for at least ten years. It’s run-time, and my silly refusal to watch things in more than one sitting, meant I never got around to it. Until now! 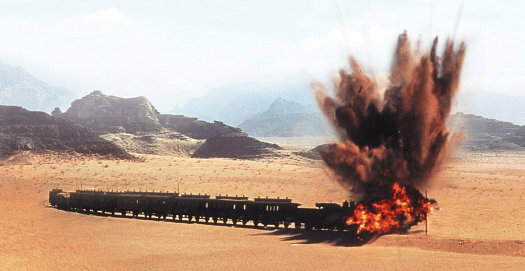 I watched LAWRENCE OF ARABIA (1962) on 7.14.14. It was my first viewing of the film. In the darkness, a pulsating exotic score rings powerfully, announcing the start of LAWRENCE OF ARABIA. This is old Hollywood orchestral movie music, running the gamut from sweet strings to pounding drums over the course of a several minute overture.We are introduced to a feeling before the Columbia title card even hits the screen. The film then starts with the death of its hero, T.E. Lawrence (Peter O’Toole) as he suffers a motorcycle accident. At a memorial service we learn that he is equal parts idolized, respected, and loathed. What kind of man is this? The movie then jumps to World War I, as a young Lawrence, an eccentric British solider, is tasked with gathering information from ally Prince Feisal (Alec Guinness). Along the way he meets Sherif Ali (Omar Sharif), beginning a relationship that goes from hostile to close to something in the middle. Through his months with the Arab people, Lawrence proves himself a bold friend. He unites the tribes, gives them a common enemy in the Turks, and leads them across the desert to glory. If that, the first half of the film, is about the building of a legend, then the second half is how a legend is dismantled. The film is surprisingly sadistic and violent at many different points, with the titular character often being the worst offender. This is a film which condemns its hero as much as it honors him. David Lean directs this with some stunningly beautiful visuals, which serve to offset the themes of what rampant ego does to a good man. When we meet Lawrence and Sherif Ali, Lawrence is a good and idealistic man who stands his ground. Sherif Ali is seen, by the audience, as a violent and weak man for defending his own. Through the movie, Lawrence becomes increasingly unsympathetic as he changes so drastically. Sherif Ali becomes more sympathetic, even has his moral compass holds on a fairly unchanged path. Lawrence is, also, not a wholly reliable character. Peter O’Toole’s performance is legendary. Sometimes he lies, sometimes he tells the truth (it is still debatable if he means it when he famously says “I enjoyed it”, since he could either be baring his soul or trying to get what he wants). Sometimes he makes himself look bad for others’ benefit, other times he trumpets himself as an extraordinary man among mortals. As the film progresses it seems as he loses sight of who and what he is even to himself. While some of this can be attributed to the idea that war is hell, the story unfolds in such a way that his breaking point (an encounter with a Turkish leader played by Jose Ferrer in a unforgettable scene) is entirely his own doing as a direct result of his ego. And, man, even over fifty years later, that scene comes of as nasty and sadistic. There is nothing subtle about the sexual implications of the scene, particularly in the fact that Lawrence spends the rest of the film refusing to talk about what happened to him. LAWRENCE OF ARABIA is an excellent film. The cinematography is all-time great. The introduction to Sherif Ali, as he emerges from the horizon, was shot with a special lens which has never been used since. Further, so much of Lean’s work is done with empty space in the frame. His shots are often geometrically balanced, giving a sense of endlessness in the desert. The editing is wonderful, including a classic moment when Lawrence blows out a match and we immediately cut to the sun rising in the desert in a slowly developing shot that modern film would not have the patience for. There is more humor than you might expect (at least in the film’s first half). Lawrence’s education in the desert and then, subsequently, his interaction with his two ‘servants’ all work for some funny bits. Unfortunately, the story does not end well for any of the people in those scenes. The script, generally speaking, is very strong and full of parallels. One such example comes in comparing the moments when Lawrence emerges from the desert having saved a man to a mighty fine reception by the Arabic people. He is given ceremonially clothing to wear because of this act. When he later wears the same clothing in the British officers’ gathering place, he receives a nearly identical reception by the British. In both moments, Lawrence is ‘other’. This is a film which has earned its reputation as great. The first ninety minutes may lead an audience to believe it is merely watching a normal, if beautiful, epic. The final two hours, however, take us on a ride we never would anticipate going on. It is not a particularly gentle ride, nor is it an innocent ride, but it is an unforgettable ride. One bonus point goes to the film score, the other goes to the cinematography. Both are works of art in their own right. ~ by johnlink00 on July 14, 2014.